Scented honeysuckle and old roses ramble this very pretty stone 18th century Woodman's cottage standing beside a tumbling mountain river and waterfall and just yards from where it meets the Upper Dovey river flowing in rocky gorges, so completely free from any flooding, within the Snowdonia National Park. 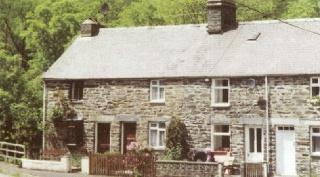 Only ½ mile from Dinas Mawddwy in a beautiful hamlet. Dolgellau is about 7 miles N.W. and the coastal resorts of Barmouth and Aberdovey just 12 / 15 miles West. The Dovey river has shingley shores, mossy banks and children and adults love it. In Autumn Sea Trout and Salmon leap up the waterfall to higher spawning grounds. Spectacular scenery all around, green and purple high mountains dotted with sheep, ancient woodlands with badgers and pheasant. Winding ferny lanes following rocky flowing rivers in secluded valleys. All this yet Dyfi Cottage is only ½ mile from pub / hotels and 1½ miles from shop, petrol and cafe. A perfect haven to relax, whether colourful days of Spring and Autumn, balmy summer days or by a cosy open fire in Winter. 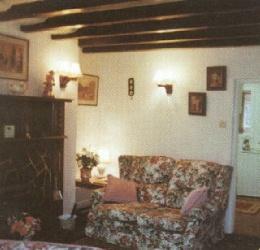 Sitting Room:- Thick walls, double glazing, oak beams, open feature stone and oak fireplace with traditional furniture and decor, colour TV with some satellite channels and video, CD/radio, books, games, plus subtle lighting add to the cosy comfortable feel whatever the weather outside. Telephone for incoming calls only. Kitchen and dining rooms:- Fully fitted pine kitchen with electric cooker with extractor fan, fridge, washing machine, drier, microwave etc with serving hatch through to pretty pine dining room seating 6 comfortably, plus Welsh dresser and wonderful views of the waterfall and woodlands. (High chair and stair gate by request). 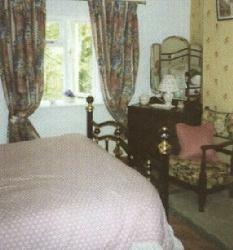 Bedrooms and bathroom - upstairs:- Two very pretty bedrooms with 'antique' brass double bed and twin bedded room plus double deluxe sofa bed downstairs (in addition to floral suite). Large shower and bathroom fully equipped and nicely refurbished. Small cot and folding bed available by request. Also electric fan for hot summers and plenty of blankets and/or electric blankets for colder weather. Bed linen included in rental. Amenities:- Economy 7 heating throughout with extra heaters as necessary. Also open fire in sitting room, some fuel provided. All Economy 7 electricity free, remainder by coin meter. Extra fuel for the fire can be purchased at local store. Off road parking. Well behaved pets welcome, by arrangement.